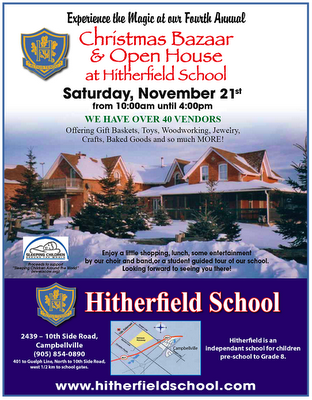 On Saturday, November 21st from 10 am to 4 pm you can help Sleeping Children Around the World and experience the magic of the fourth annual Christmas Bazaar and Open House at Hitherfield School. Proceeds to support Sleeping Children Around the World. Directions: 401 to Guelph Line, North to 10th Side Road, west 1/2 km to school gates. Two Stratford residents will bombard some of the poorest regions of Bangladesh with "bed kits" this week. Doug MacDougald and Sue Orr (pictured at right after they arrived in Bangladesh) will distribute a total of 9,000 bed kits in about two weeks. The kits are from Sleeping Children Around the World and contain a mosquito net, mat or mattress, blanket, pillow, clothes, towel and school supplies. This will be Mr. MacDougald's third trip distributing bed kits and his second to Bangladesh. This trip is extra special because one of the areas Mr. MacDougald will be working in is the city of Jessore. It's the same city his father was posted in during the Second World War and he heard about it growing up. Fittingly as well, it was his parents who got him interested in contributing to and distributing bed kits. Bangladesh will pose its own set of challenges. It's hot, has poor infrastructure and it's the most densely populated country in the world. There are an estimated 162 million people crammed into 148,000 square kilometres. That's double the size of New Brunswick which has a population of 748,000 people. All of that poses logistical challenges but there are bigger hurdles to overcome. "The big challenge is reconciling myself to the lives these kids have. Luck of the draw they're born in Bangladesh and have their lives. Luck of the draw we're born in Canada and have our lives," Mr. MacDougald said from the airport yesterday afternoon. The kits cost $35 and many churches, schools and other organizations in Stratford and area have purchased them. All of the money goes toward the contents of the kits. None of the $35 donation goes toward administration or distribution so volunteers pay their own way. "I think the return is worth more in the end," Ms. Orr said while waiting to clear security. The fact all the money goes to the bed kits was the draw for Ms. Orr. This is her second trip to distribute bed kits but her first trip to Bangladesh. Not sure what to expect, she packed a jar of peanut butter and some power bars to eat while there. Each child is photographed with their kit and the photo is sent to a donor. Ms. Orr noted the kits help the whole family not just one child. "It's like they've hit the lottery," she said. Many of the kids can't believe everything laid out is actually for them, Mr. MacDougald said. The bed kits last about eight years. Bangladesh was originally part of India but separated as part of Pakistan in 1947. Economic neglect and discrimination led to war in 1971 and the formation of present day Bangladesh. For more information about bed kits go to the Sleeping Children Around the World website at www.scaw.org. Follow their trip as it happens on Sleeping Children's Live Reports blog. The 10th annual concert, “An Evening With Lynette and Friends” will be held on the 28th November, 2009 from 5 – 7 p.m. 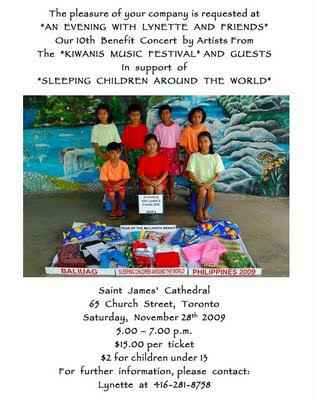 This features artists from the Kiwanis Music Festival and friends who will be singing and performing for the children in underdeveloped and developing countries that are helped by SCAW. Unfortunately, I have had to raise the cost of entrance this year. Tickets are now $15 for children over 13 and adults. Children (under 13) tickets are $2 and there is no charge for the under 5s. The reason I have had to do this is because the cathedral has raised its rental fee from $0 to $1,600 for the concert. I am hoping that this extra money will offset the costs. We already have a sponsor for the evening, but to ask them to increase their generosity by this amount would be too much. Because of this marked increase in rental costs, this is the last time we will be holding this event at St. James. I hope you understand. You will certainly not be disappointed by the quality of performers that have been lined up for the evening, and I am sure you will enjoy the music and it will set you and your family up for the season. If you have any queries about this event – please email me.